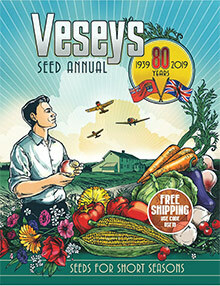 Vegetable and Herb Seeds - When you purchase vegetable seeds from the Veseys catalog, you can be confident that they have been carefully selected from the trial gardens at Vesey's research farm for performance in a wide range of climatic and soil conditions. They offer certified organic vegetables, vegetable seed collections, their own "Top Picks" for your best kitchen garden. You will find untreated vegetable seeds and herb starter plants here, from asparagus and fennel to squash, strawberries and a wide range of culinary, medicinal and ornamental herbs. Flowers and Custom Seed Packages - Plan your garden for the seasons in your region, with hundreds of seeds for annual, biennial and perennial performance. Their carefully organized online store helps you make selections of flower seed for all summer blooms, seaside plantings, rock gardens and direct seeding. You will be tempted by the gorgeous colors of alyssum, aster, lupines, hollyhock and sunflowers, and that is just a start. For a special gift, consider personalized seed packages of bird & butterfly wildflowers or Munstead Lavender for everything from wedding favors to corporate advertising. Tools & Supplies and Bird Feeders - You will find everything you need for all stages of managing your organic garden right here. From planning and seed starting to crop harvest and storage, they have the tools and supplies you need. Find gardening aids, fertilizers and soil amendments, cultivating tools and gardening gloves and clothing. They also have a charming selection of suet feeders, bird houses, bat shelters, nests and bee hives to welcome nature's pollinators and beneficial predators to your garden. Commercial Seed - The organic gardening experts at Veseys catalog have a long history of working with commercial vegetable growers and offer the best varieties and superior seed quality that you need for your successful land management and production. Choose from the hundreds of certified organic varieties online, or contact the seed management team to source the seeds and quantities you are looking for. They provide documentation for your certification reviews and partner with you in your commitment to biodiversity, healthy soil and maintenance of productive farm ecosystems. If there is a gardener, bird lover, culinary guru or nature lover on your gift list, you will find the perfect gift giving idea here, with great coupon code savings, too. Start with their carefully selected seed combination packages, browse the colorful bird feeders or opt for a Veseys Gift Certificate.